Phytoplankton: Microscopic algae that live suspended in the water. Zooplankton: Tiny animals that drift through the upper surface of water bodies and feed on phytoplankton. Euglenoids (Euglenophyta). The euglenoids, or Euglenophyta, are single-celled, protozoan-like algae, mostly occurring in freshwater. 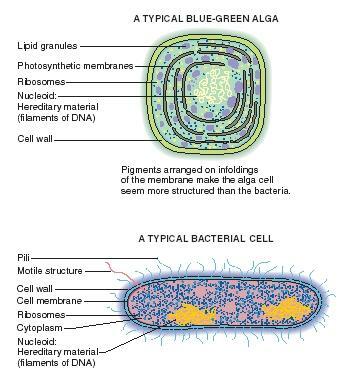 Unlike all other algae, they have no cell wall. Most euglenoids make their own food using light energy from the Sun but are capable of surviving in the dark if fed organic materials. Some species are heterotrophic, meaning they do not produce their own food but feed on organic matter suspended in the water. bottom. This fine-grained sediment is often used for filtration in liquid purification systems. Fire algae (Pyrrophyta). Fire algae, or Pyrrophyta, are single-celled algae and include the dinoflagellates (pronounced dye-no-FLAJ-uh-lets), which have two flagella used for locomotion. Most of these microscopic species live in salt water, with some occurring in freshwater. Some species of dinoflagellates emit bright flashes of light when exposed to air, which at night look like fire on the ocean's surface. Green algae (Chlorophyta). The green algae, or Chlorophyta, occur in freshwater, although some live in the sea. Most green algae are single-celled and microscopic (able to be seen only under a microscope), forming the slimy green scum found in stagnant ponds. Others are larger and more complex, forming spherical (round) colonies composed of many cells or occurring as straight or branched filaments (long, thin series of cells). Green algae are thought to be in the evolutionary line that gave rise to the first land plants. branched filaments. The larger species have filaments that are massed together and resemble the leaves and stems of plants. They have no flagella and typically grow attached to a hard surface or on other algae. Some species contain a red pigment; others range in color from green to red, purple, and greenish-black. The cell walls of Coralline red algae become heavily encrusted with minerals and help to cement and stabilize coral reefs. Brown algae (Phaeophyta). The brown algae, or Phaeophyta, are shiny brown seaweeds that are especially abundant along rocky coasts, although some float in the open ocean. Brown algae are large in size and include the giant kelps, which are located along the Pacific coast and form forests that provide habitat to a wide range of marine life. Some species of brown algae have structures called holdfasts that anchor the algae to submerged rocks. Attached to the holdfasts are stemlike stalks that support wide leaflike blades. These blades provide the major surface for nutrient exchange and photosynthesis and are lifted up toward the water's surface by air bladders. Brown algae contain an accessory brown-colored pigment that gives the plants their characteristic dark color. Other well-known brown algae are the common rockweed Fucus and Sargassum, which floats in a thick, tangled mass through the Sargasso Sea—a huge area of slow currents in the mid-Atlantic Ocean that supports a variety of marine organisms. Yellow-green algae (Xanthophyta). The yellow-green algae, or Xanthophyta, primarily occur in freshwater. They can be either single celled or form colonies, their cell walls are made of cellulose and pectin compounds that sometime contain silica, they can have two or more flagella for locomotion, and they store their energy as carbohydrates. They derive their yellow-green color from the pigments carotenoids and xanthrophyll. 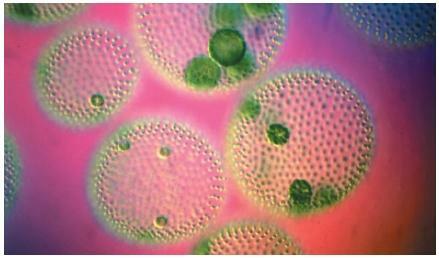 Microscopic algae are the source of much of Earth's oxygen. Algae are also very important ecologically because they are the beginning of the food chain for other animals. Phytoplankton, a mostly single-celled type of algae, are eaten by small animals called zooplankton (mostly crustaceans such as tiny shrimp) that drift near the surface of the sea. The zooplankton are in turn fed upon by larger zooplankton, small fish, and some whales. Larger fish eat the smaller ones. At the top of the open-water food web may be fish-eating birds, seals, whales, very large fish such as sharks or bluefin tuna, and humans. The larger algae provide shelter and habitat for fish and other invertebrate animals. As these algae die, they are consumed by organisms called decomposers (mostly fungi and bacteria). The decomposers feed on decaying plants and release important minerals that are used by other organisms in the food web. In addition, the plant matter partially digested by the decomposers serves as food for worms, snails, and clams. Algal blooms are an overabundance of algae that can severely affect the aquatic ecosystems in which they occur. Some marine species of dinoflagellates grow wildly at times, causing red tides that turn the surrounding sea a deep red color. The great numbers of microorganisms can rob the water of oxygen, causing many fish to suffocate. The dinoflagellates also produce extremely poisonous chemicals that can kill a wide range of marine animals, as well as humans who eat shellfish containing the toxins. Red tides are natural events, although some scientists believe human interference contributes to their occurrence in certain regions. Freshwater algae can also cause problems when they are overly abundant. Algal blooms can cause foul tastes in water stored in reservoirs that are used to provide drinking water to nearby communities. Eutrophication is a major problem that is associated with algal blooms in lakes. A direct result of human interference, eutrophication is caused by the addition of excess nutrients (runoffs of phosphate and nitrate from chemical fertilizers and sewage disposal) to the water that encourage algae to grow abundantly. As the algae die and sink to the bottom, most of the water's oxygen is consumed in breaking down the decaying plant matter. Fish and other animals that require large amounts of oxygen can no longer survive and are replaced by organisms with lower oxygen demands. Brown and red seaweeds provide important economic products in the form of food for people and resources in the manufacturing of industrial products. These seaweeds are mostly harvested from the wild, although efforts are being made to cultivate large algae. A red alga known as nori is a popular food in Japan. Another alga known as sea kale is consumed dried or cooked into various stews or soups. Sea lettuce and edible kelp are other commonly eaten seaweeds. Brown seaweeds provide a natural source for the manufacture of chemicals called alginates that are used as thickening agents and stabilizers in the industrial preparation of foods and pharmaceutical drugs. Agar is a seaweed product prepared from certain red algae that is used in the manufacturing of pharmaceuticals and cosmetics, as a culture medium for laboratory microorganisms, and in the preparation of jellied desserts and soups. Carrageenin is an agarlike compound obtained from red algae that is widely used as a stabilizer in paints, pharmaceuticals, and ice cream. Thank you very much for the effort you have put in . Thanks for the contribution toward the course study and acheivement made thus far. This is very useful page for projects where children can use like me! Thanks for the info cuz I really need this info for a report on algae and this is the best website ever!!!!!!! thanks for the great cotributions, this is making our study simply possible. Thats good effert for the school pupils. I appreciate this work. Good information which is useful for the research and study. Great work. Thanks for your efffort in putting this down. Anyway, what about the importance of algae in environmental control. Love this site! But i hate the work i have to do in science class so BYE! Thanks for this information on algae. I didn't realize there so many forms of algae and its usefullness. is there any effect of colors in light on the oxygen algal production? thanks for the information on algae,it a mojor contribution to my BEd studies. thank u so mush for this effort.its very interesting. Thank you a lot for the effort you have put in..am sure this will help me. I am really impressed with your work and so much interested on it. I LEARNED A LOT FROM YOUR INFO'S .. I'LL VISIT YOU AGAIN SOMEDAY .. YOUR efforts are realy appriciating.but ad some more information if possible! Yesterday my mother purchased Tuna fish, when she cut into pieces the bright green pigment/colour appears in each layer of flashes within the body. I forbade to cook it, because I want to know what is the green colour? either green algae or other? Please help me in this regards. I'm waiting for your favourable reply soon. strontium is a trace mineral recently discovered to influence bone health quality better then calcium ,but it competes with calcium in absorption therefore has to be taken hours apart from calcium and calcium to be supplemented while taken it ;this brought me to favor a natural source for strontium rather then have to get calcium in supplement form ;and hope for the best ;i guess my best bet for it is seaweed and algae ,now which of them has the highest concentration of it ? i once heard of something called cold fire, i saw a photo with it in the palm of someones hand, i always though of it as algae but i do not know what it's proper name is. can you help me? This artical is very good for get information about algae.and I also got information for my academic work.thanks. thank you. that really helped with my science project. Thanx a lot for the page. IT is useful to many of the students doing bioversity. keep it up. My name is Steven E.B.Koroma from Sierra Leone studying for a Masters Degree In Environmental Management and Quality Control at Njala University. I found this article not only interesting but very educative. I want to use part of it to complete my second semester assignment on Water Pollution and Monitoring course. Could you please help me with your reference(s)? I am making this web site a permanent friend because I stand to gain a lot of knowledge from it. How to control single cell alge when in marine aquarium? Am a first year student at Kenyatta university in Kenya pursuing degree in botany and zoology .This article is helpful to young minds as they en devour to infuse technology in their studies ,embrace international intellectual guidance and find out what exists beyond their scope. I would personally encourage it as i hope that it would help many to go through their work with passion in assurance of a solomonic guidance from this wonderful site. The fire algae are very important because they cause red tides and some contain what substance? I like any information about Algae. Thanks for the valuable notes. This was a very useful article because it helps me to answer my assignment questions. Thank you very much. It has really help me to filled my lab manual. I am a first year Student at Day star University pursuing degree in Biomedical science . This Article is significant to the infants who would mind to come up with a number of inventions in the field of science diseases. Thanks for the essential Notes.